Today, NHS England published its Combined Performance Summary, which provides data on key performance measures for February and March of this year. Here we show some of these statistics and how they compare with previous years. Last month, the Clinically-Led Review of NHS Access Standards Interim Report was released, which proposed some significant changes to many of the targets reported on here. Whilst field testing is occurring, NHS England will continue to monitor performance against the current access standards that are set out in the NHS Constitution Handbook. For interactive charts showing the quality of health and social care over time, please refer to our 200+ indicators. 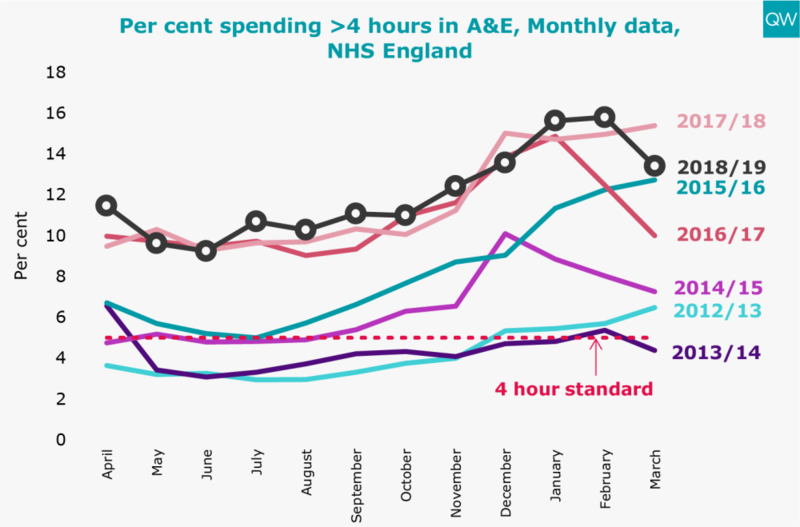 In March 2019, 13.4% of people attending A&E spent more than 4 hours from arrival to admission, transfer or discharge. This is a 2.4 percentage point drop on the previous month and 2 percentage points lower than in March 2018. 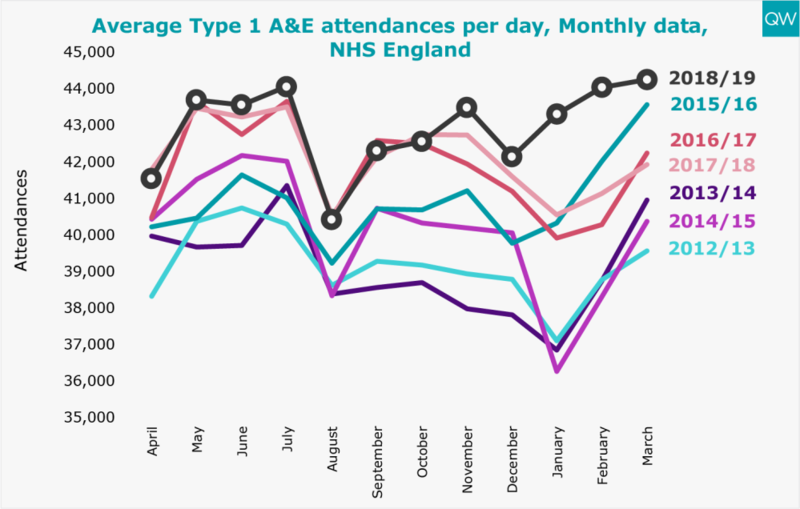 This small improvement in performance comes despite a 5.5% increase in the average number of major A&E department (Type 1) attendances per day in March 2019 compared to March last year. In March 2019, there was a total of 1.37 million Type 1 A&E attendances, equating to an average of over 44,000 attendances per day. Emergency admissions via A&E have been increasing year-on-year, reaching over 415,000 in March 2019. 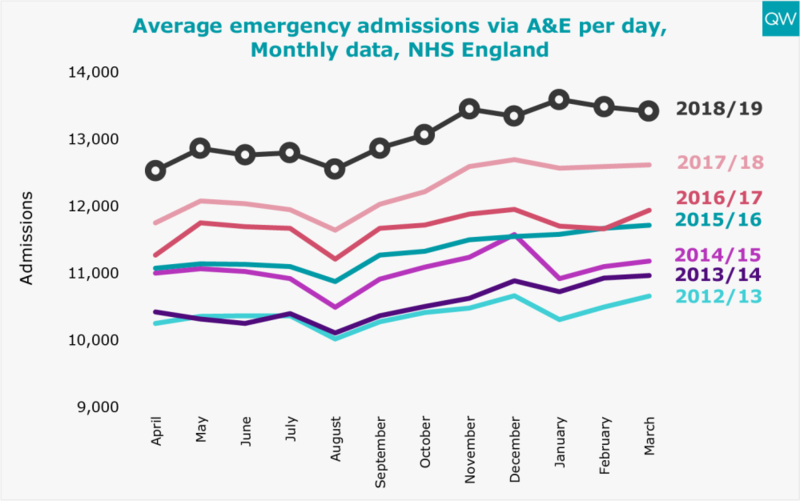 The average number of emergency admissions via A&E per day reached 13,418 in March 2019, which is 6% higher than the same month last year. 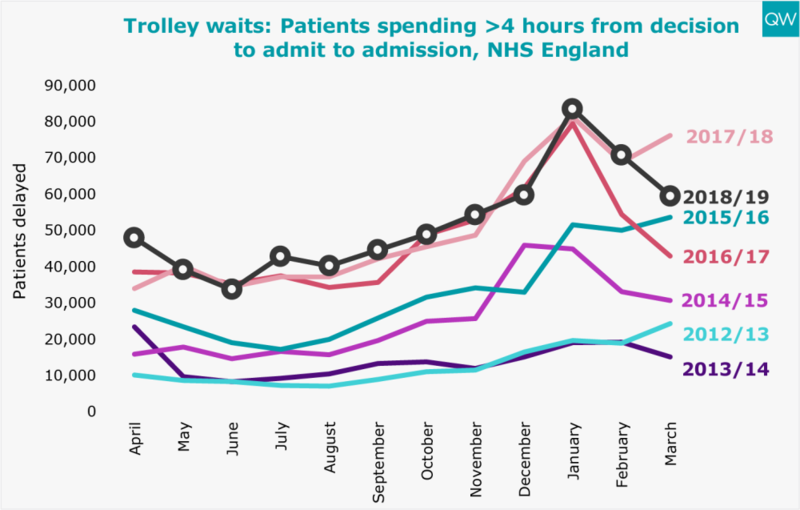 59,508 patients spent more than 4 hours waiting on a trolley from decision to admit to admission in March 2019. This is 22% lower than March of last year, but 38% higher than it was two years ago. 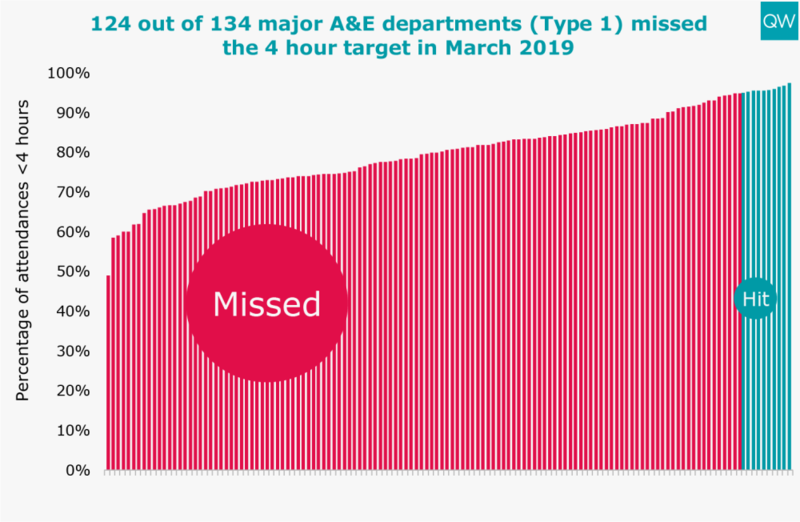 Only 10 out of 134 major A&E departments met the four-hour A&E waiting time target in March 2019. 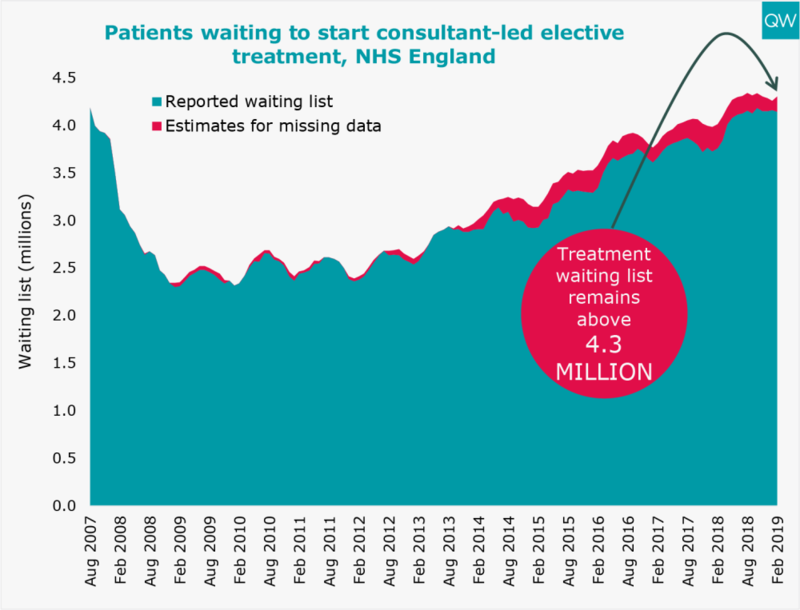 The total number of people waiting to start consultant-led elective treatment remained above 4.3 million in February 2019. The proportion of people waiting over 18 weeks to start elective treatment reached 13% in February 2019. It has been three years since the referral-to-treatment target was last met. 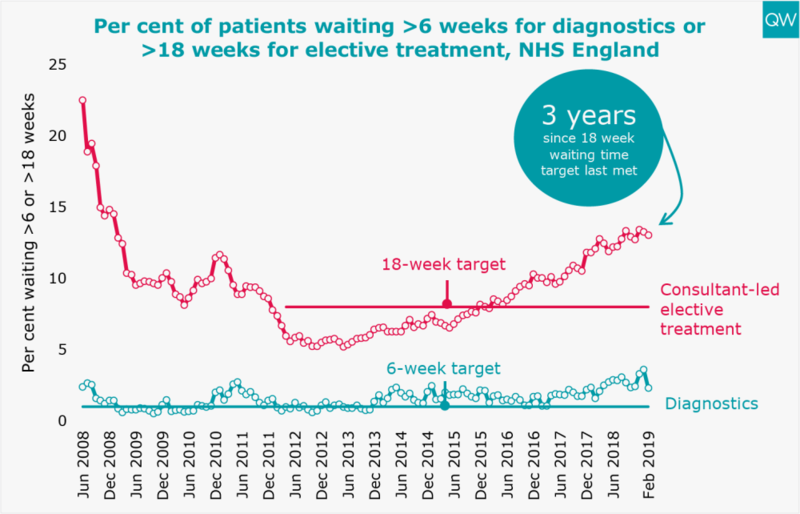 In February 2019, 2.3% of patients had been waiting over 6 weeks for a diagnostic test, which is a 1.3 percentage point drop on the previous month but 44% higher than it was in February 2018. 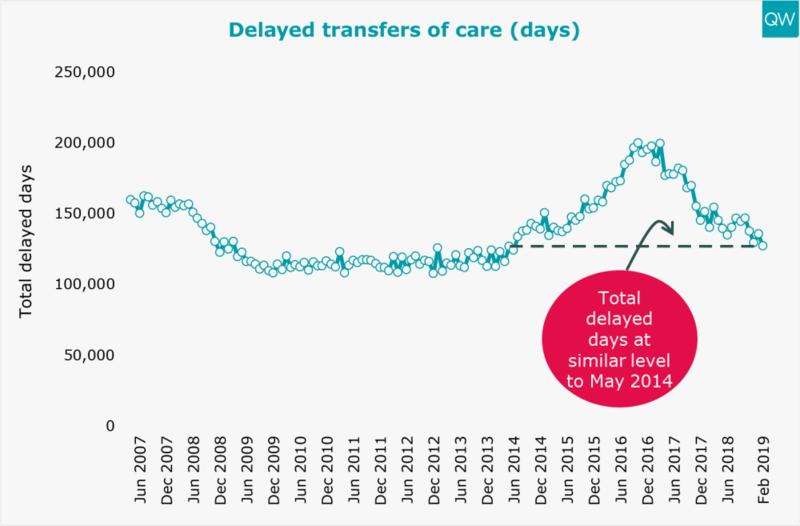 The total number of delayed transfer of care days decreased slightly to 127,281 in February 2019, which is almost the same as it was in May 2014. 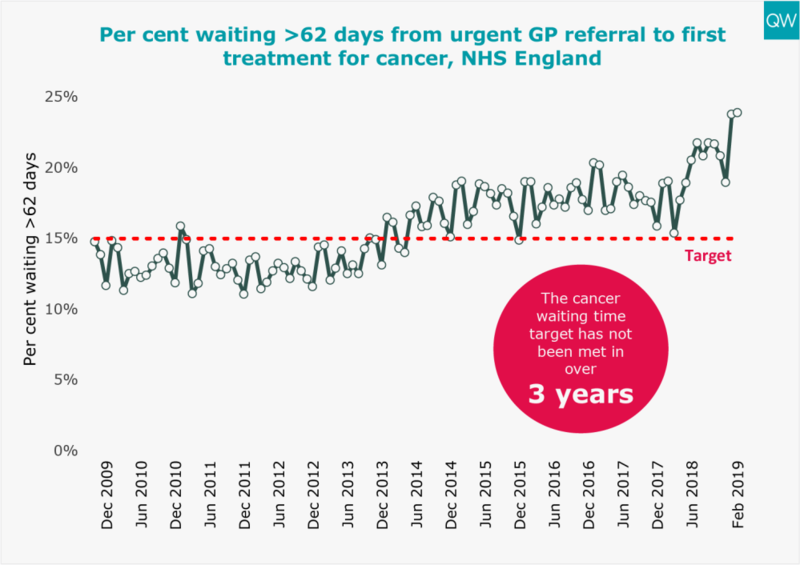 In February 2019, 23.9% of patients waited longer than two months to start their first treatment for cancer following a GP urgent referral. This is a small 0.1 percentage point increase on the previous month, but over 4.8 percentage points higher than in February 2018. 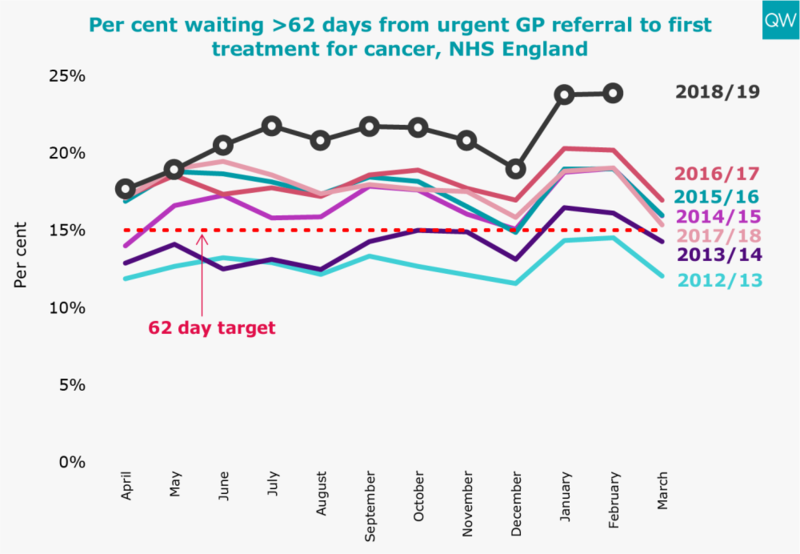 Performance is usually worse in January and February of any given year, but since June 2018 there has been a distinct deterioration in waiting times for cancer treatment compared to the previous year. The 62-day cancer target was last met over three years ago.